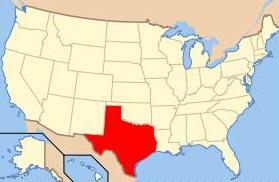 This page offers an alphabetical listing of place names throughout Texas. This is not a complete list of every last place name that has ever existed in Texas. It does include not only a sampling of the largest communities in the Lone Star State, but also a number of smaller towns. Located predominately in the Central Time Zone with the extreme southwestern corner residing in the Mountain Time Zone, Texas is bordered on the north by Oklahoma, on the west by New Mexico, on the northeast by Arkansas, on the east by Louisiana, and on the south by Mexico. Be sure and visit our collection of unusual, bizarre or humorous names of towns.